At the core of every effective worksite wellness program are wellness activities that help employees adopt and maintain healthy behaviors. These activities are also known as wellness challenges or wellness campaigns. Behavior change campaigns usually last between two and six weeks while wellness challenges can happen in just one or two weeks. The names campaign or challenge are often used interchangeably. Challenges can be team based or they can allow participation as individuals. What makes challenges important is the fact that they help employees create healthy lifestyle habits. Worksite wellness challenges should be at the heart of every successful wellness program. When done correctly, worksite wellness challenges help employees and their dependents improve employee health behaviors and reduce elevated health risks. Wellness challenges are perhaps the most important part of any effective wellness program. The Fast Food Guide challenge is designed to help employees make healthier fast food choices. Originally, it was designed to help truckers and utility workers improve their nutrition as they typically eat fast food almost every single day. You can read more about the fast food guide here. Before the campaign begins every employee is going to get either a printed or PDF copy of the guide or they can download the free app. There is a kickoff meeting or video that explains how the challenge works. In week one, every participant will watch a short introductory video explaining why it is important to eat healthy and to make healthy fast food selections. This is the portion of the campaign where employees discover why good health requires good nutrition. It also explains why it is so difficult to navigate the fast food landscape. In week two of the challenge employees are encouraged to use the fast food guide actually pick a healthy fast food. They use this tool actually purchase a healthy option. More importantly they also learn why some foods are and others are not healthy. Learn how to look for grams of saturated fat, trans fats and excessive sodium, while choosing whole grains, fruits and vegetables. In week three they put their new knowledge to work. Without using the guide they are shown how to discern between healthy and not so healthy fast foods. In essence employees learn to be the guide. They learn to internalize the principles of good nutrition so that they can go to any fast food restaurant and still make healthier choices. In week four, they share their fast food guide with someone they care about. They can either give them the printed copy of the book or they can tell them where to download the app. The idea is to create social support by sharing the guide with others. Employees will report on how they did, and the challenge will end. Once it is known who has registered and completed the challenge, gift cards or small prizes are randomly awarded to a few of the employees who have finished everything. Not every participant gets the incentive. The incentives are a powerful part of the motivation to get employees to engage in the challenge to the first place. What is important to note is why the various components of this challenge are written and included the way they are. Effective worksite wellness challenges are strategic. They are created based on solid behavior change science. The Fast Food Guide challenge, along with all the WellSteps challenges, are based on these exact same behavior change principles. They are the secret sauce of improving employee health. Every WellSteps challenge is based on the behavior change principles derived from the RE-AIM framework for sustainable behavior change. This behavior change model states that to have effective behavior change an intervention or challenge in this case, must have both reach and impact. The behavior change intervention must reach as many people as possible and it must impact their health behaviors. To some, this may sound like just a lot of scientific mumbo-jumbo but this is important. To have wide reach, a wellness program must touch every single employee in multiple ways with multiple messages all delivered at the right time. Effective reach is nothing more than effective marketing. Here is one of the most popular blogs I’ve ever written. It is the complete guide to employee wellness program engagement. It is the model we use to get maximum reach for every campaign we offer. The best wellness challenges in the world are worthless if your program does not have reach. Yes, that also means that you need to leverage technology to give employees every opportunity to participate either through a computer, a mobile device or traditional paper versions of your campaigns. In addition to having very good reach, corporate wellness challenges must also have a significant impact. To create effective challenges WellSteps uses the AMSO (Awareness, Motivation, Skills, and Opportunities) behavior change model. We changed the “O” in AMSO to include more than just opportunities. For us, this part of the model includes policy changes, environmental and social support. Rather than call this Opportunities, we just use the work “policy”. The AMSO model guides everything that we do. It includes the four components that are essential to every successful wellness challenge. We go to great lengths to verify that each of these four components is represented in every single challenge. The four components are pretty easy to understand. Awareness and education is the “what” of behavior change. The motivation is what drives us to change. The skills and tools portion is the “how do I do this?” part, and the policy and environment part is a conglomeration of environmental changes, policy and environmental changes, and support from others that all help us to be successful. Which one do you think is the most powerful and helping people adopt and maintain healthy behaviors? The most important part of the behavior change process is actually policy and environment. About 40% of the success of behavior change happens when we establish a supportive environment and when we receive peer support from others. The least important aspect of this model is awareness and education at just 5%, yet this is where most wellness programs spend most of their time and budgets. Let’s take a deeper look into each one of these components and how they are used to create effective employee wellness challenges. All of us are familiar with this part of the behavior change process. This is the easy part of wellness. Wellness programs use health risk appraisals, biometric screening, posters, flyers, videos, books, email notifications, text messages, payroll stuffers, Internet sites, magazines, lunch and learns, special speakers, company newsletters, blogs, and many other forms of communication to create wellness awareness. Each of these wellness activities help individuals become aware of and educated about good health practices. They help us understand what health risks are and what it really means to have an elevated health risk. They help us learn whether or not we have elevated health risks or unhealthy behaviors. You can’t begin to change an unhealthy behavior unless you can identify unhealthy behaviors. This blog is an example of how awareness and education can work. As you read and look at the images you are becoming aware of and educated about the WellSteps approach to successful wellness programming. In week one of the fast food guide challenge that I described above, participants learn about the importance of making healthy nutrition choices. The video and content in week one is the education and awareness component of this challenge. It is the first step in helping people down the road to successful behavior change. I have already written extensively here and here about the need to have the right kinds of motivation in your wellness program. Most wellness programs encourage employees to participate in a variety of health promoting activities. The use of incentives is just one strategy that can be used to motivate employees. All of us have been able to change our behaviors at one time or another. We change behaviors constantly and some of those behaviors become daily habits. Think about the last major behavior change you implemented. What motivated you to change that behavior? Why did you do it? Chances are pretty good that the last time you changed of behavior you did not do it because someone was offering you some kind of monetary incentive. We change behaviors for a lot of reasons. Peer pressure, love, the desire for something better, fear, and just wanting to improve our lives can provide ample motivation to change. Here are three images that can motivate people to change behaviors. Not one of them is associated with a monetary incentive and yet they can be very powerful agents of change. Every WellSteps challenge, including the Fast Food Guide Challenge shown above, uses incentives. These are small monetary or tangible rewards randomly given out to a selection of those employees who have completed all the steps of the challenge. The incentive itself is really not the motivator, it is the hope of winning the incentive that motivates people to participate. Obviously some employees will win the incentive, but not all. This is enough to get them to engage. This is that “how” of behavior change. It is one of the most important aspects of successful behavior change, and it is the one that we perhaps neglect the most. Biometric screening is great at helping people understand their current health risks but unless that screening helps people with the skills and tools they need to reduce their elevated health risks, the screening won’t do much to improve employee health. Awareness and motivation are important steps to start the behavior change process but without the requisite skills and tools failure is inevitable. As wellness professionals we need to show people exactly how to change behavior. We need to show them how to overcome the barriers that are preventing them from living healthy lives. To have a healthy diet individuals must know how to shop for, purchase, and prepare healthy foods. Cooking healthy foods is a skill. Learning to understand nutrition labels and finding good tasting produce is a skill. Learning how to grow a garden is a skill. Learning how to have business meetings and still order healthy foods is a skill. Those who have healthy lifestyles have mastered most of the skills needed to be healthy. People with a healthy lifestyle know how to cook vegetables in a way that makes them taste good. They know how to identify foods that are good for them and foods that should be avoided. They know how to bargain shop for healthy foods. They know how to identify high-calorie foods and to control portion sizes. They have learned that many times they can share a meal with someone else and still have plenty of food left over. All of these are specific skills that have to be demonstrated, learned, and mastered if behavior change is to become permanent. There are skills for healthy nutrition, exercise, stress management, relaxation, conflict management, and tobacco avoidance. Wellness programs need to demonstrate and teach the skills that people need to have healthy behaviors. This learning can take place during lunch and learns or by viewing the web. Having employees bring in food for a healthy potluck will expose employees to different ways of cooking healthier options. 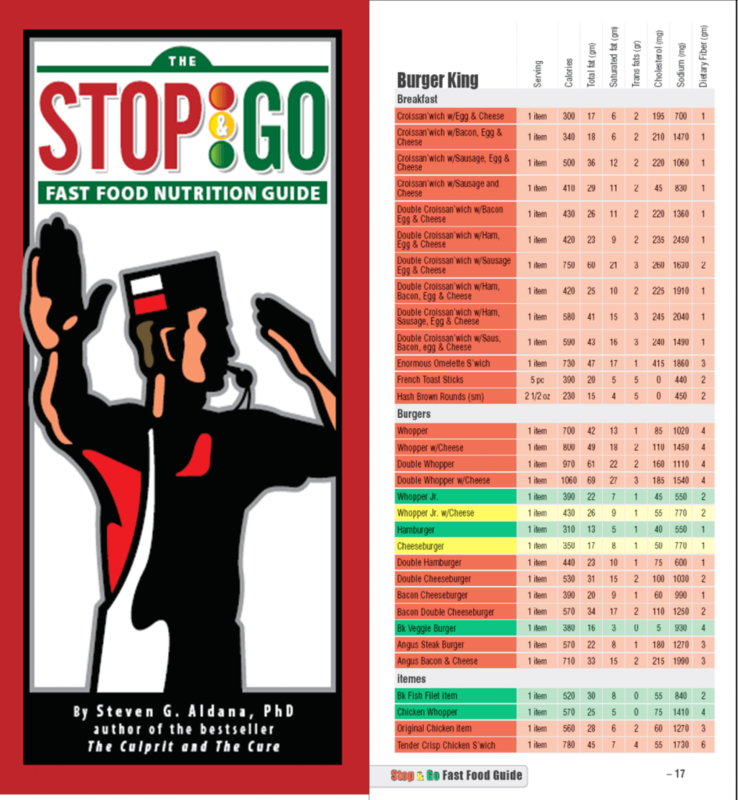 The Stop and Go Fast Food Nutrition Guide that is used in the Fast Food Guide challenge is just a tool. It’s FREE to everyone with a mobile phone. This guide gives employees the tools and skills they need to navigate the fast food world and make the healthiest selections possible. In addition to skills, sometimes we need specific tools to help us. I like to cook Thai food; it’s a delicious way to eat a lot of vegetables. There are certain tools you need to make Thai food. You need have the right spices, a good skillet, and the right recipes. Employees who exercise on a regular basis may need access to a gym, exercise clothes, exercise shoes, sports equipment, or even a company-sponsored sports team to encourage them to participate. There are lots of tools that are our disposal to help us eat right and exercise regularly. You don’t necessarily have to buy all the required tools for your employees but you do have to educate them about how the tools can be used and where they might find them. For example, employees who want to walk at lunch could use a map of the local walking trails and paths to help them find the right location and distance. A map of the local walking trails or paths is a tool that can help them accomplish their goal. All workplace wellness challenges should prove employees with the tools and skills they need to be successful. The last step of the behavior change process is the most important one. It’s not just about changing the culture and environment, it’s about altering policies of the worksite, creating social support, and changing the physical environment. It’s the most important because it has the largest impact long-term on helping people have healthy behaviors. Nationally, about 21% of the population smokes cigarettes, but in California the smoking rate is about 9%. Why is the smoking rate in California so much lower? The main reason is because the state of California has implemented a variety of smoking policies, more than any other state. There are few places where a person can smoke in California. You cannot smoke at the beach or in a public park; your car and your own home are about the only places you can legally smoke. Strict policies are not necessarily the solution to having a successful wellness program, but carefully crafted and supportive policies are. Having healthy food options in a company cafeteria is a policy: no one is being forced to eat healthy foods, but at least the healthy foods are present, and they can be sold at a lower price point. This policy makes it easier for people to purchase and consume healthier foods over less-than-healthy foods. Humans are very social creatures. We depend upon each other for many things, including our attempts to be healthy. Spouses and significant others are perhaps the most important part of a successful behavior change effort. Is is possible to change behaviors without the help of others, but it is extremely difficult. It is easier to be healthy when someone is joining us on this journey. Obviously it can cost more money to include spouses and significant others in your wellness program. But it’s likely you are paying for the medical expenses of spouses and significant others. If the goal of your wellness program is to reduce employee medical expenses, it only makes sense that you would help all plan members improve health behaviors. Spouses and significant others should be able to participate in your incentive plan, team competitions, lunch and learns, and they should be receiving your wellness newsletter and emails. They should be invited to participate in as much of the wellness program as possible. The best worksite wellness programs recognize the importance of social support and do everything they can to help employees get help from others. The Fast Food Guide challenge teaches employees to follow certain rules regarding fast food purchases. They are encouraged to read the labels and not purchase any fast food that has trans fats. This is a form of policy that employees can follow. In week four of the Fast Food Guide challenge employees are encouraged to share the guide with someone they care about. This social sharing cultivates strong social support. The AMSO behavior change model tells us that your employees will be way more successful when they have support and encouragement from others. Below I have re-labelled the Fast Food Guide Challenge to show exactly where it includes each component of the AMSO model. Each week of every challenge tries to focus on a different component. Successful challenges use most if not all aspects of the AMSO model. Sometimes you have to get creative to get them all included, but the result is worth it. When employees participate in well designed challenges, they adopt and maintain new behaviors. Employees get improved health and employers get healthier, more productive employees. We’ve been using this approach for many years and we have lots of published scientific studies that show our challenges work. Here is a list of the campaigns and challenges created by WellSteps. Even though they all focus on different health behaviors, every one of them uses the four components of this behavior change model. Each one has a component of education and awareness, motivation, a set of tools and skills, and policy or environmental supports that make behavior change possible. It is these four steps in the behavior change process that help the challenges succeed. After 30 years in the wellness profession this is the best way I know how to create effective wellness challenges and ultimately effective wellness programs. 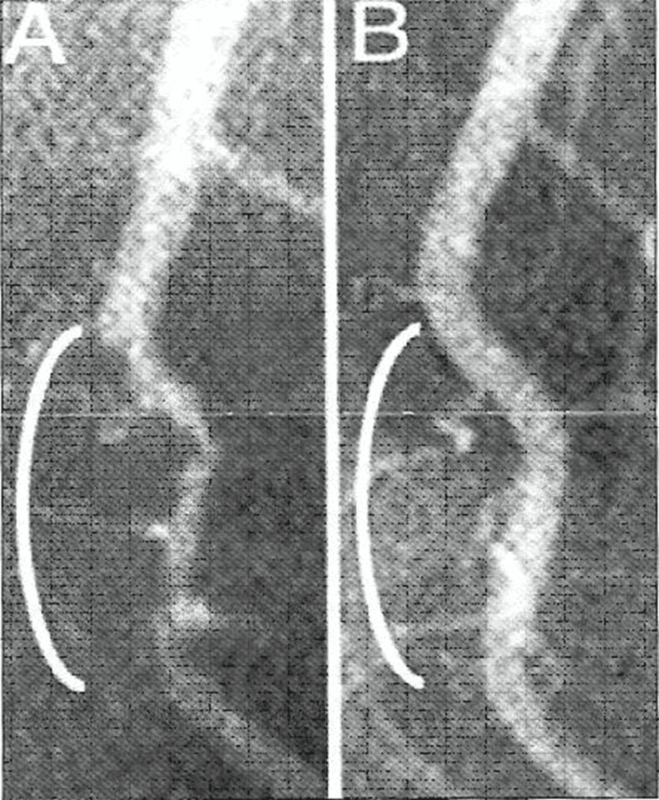 Previous PostHow Much Do Wellness Programs Save? 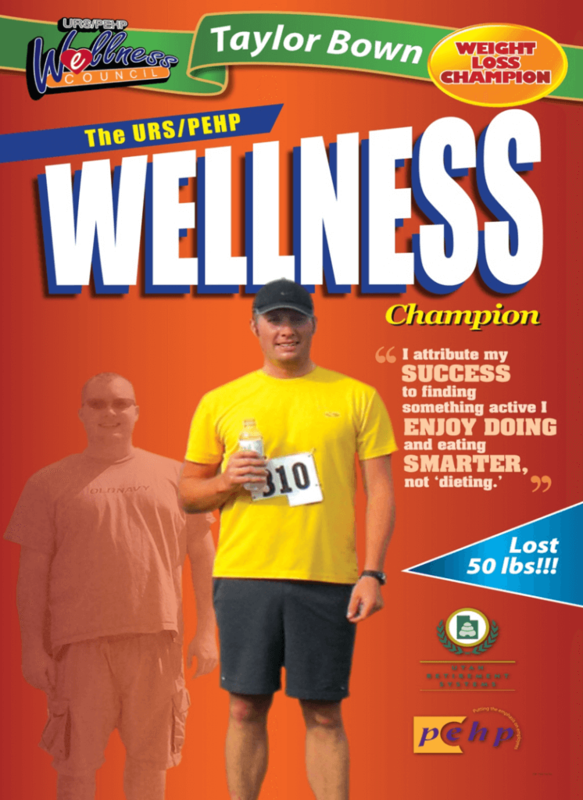 Hi Steve, almost 25 years ago Larry Chapman and I developed the first Wellness Challenge in a hospital setting. The key part of the strategy was a criteria based approached tied to incentives (not outcomes based that are much more invasive). the program continues to be used today by employers. One of the keys to it’s long-term success has been that it is structured in a manner that engages employees over an extended period of time rather than short periods. We have also found that having a 5-7 criteria as part of the program design allows for employees to focus on those areas of interest and that they are either ready to make change in or that they are already in a active or maintenance phase. This allows for flexibility and choice by the participants but also allows administrators to evaluate the program long-term for an employee population.